PX4Flow optical flow sensor is known for its ability to make drone fly in non-GPS or GPS denied environment, however it needs a alittude sensor to work perfectly. Normally it comes with sonar but Arducopter website recommends use of Lidar and also recommends to avoid using sonar. This combo sensor is perfect low cost solution to this problem. It uses TFMini lidar for accurate altitude mesurement upto 6 meters in outdoor. PX4FLOW is a smart optical flow sensor. The sensor has a native 752 x 480 pixel resolution. The optical flow is calculated using a 4x grading and cropping algorithm. The calculation speed is 250Hz (daytime, outdoor) with very high sensitivity. Unlike other mouse sensors, it can operate in indoor or outdoor dim light at 120Hz (dark, indoor) calculations without the need to illuminate the LEDs. You can also reprogram it to perform other basic, efficient low-level machine vision tasks. The PX4FLOW (Optical Flow) Sensor is a specialized high resolution downward pointing camera module and a 3-axis gyro that uses the ground texture and visible features to determine aircraft ground velocity. Although the sensor is with TFMini Plus LiDAR Distance Sensor. 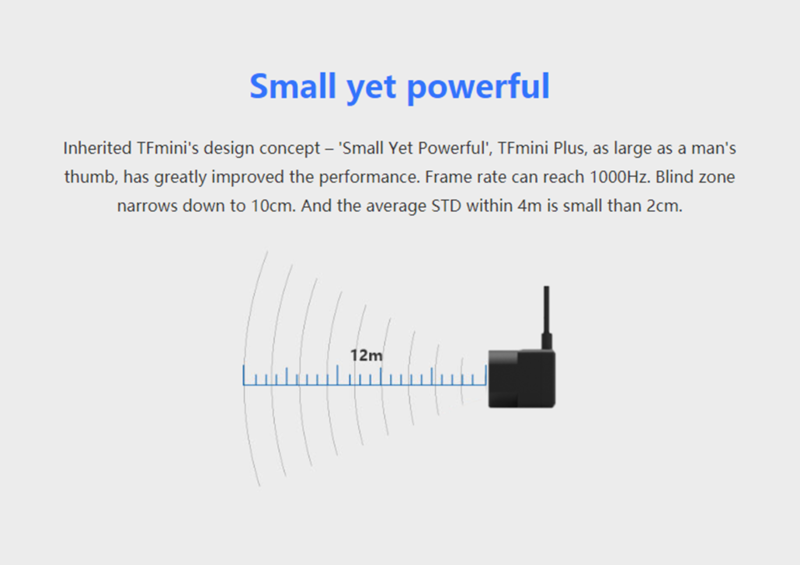 Range of TFmini Plus LiDAR Distance Sensor is 12m. STM32F407, 168 MHz Cortex M4 core processor (128 + 64 KB RAM). 752 × 480 MT9V034 CMOS image sensor. 16 mm M12 lens (Integrated IR filter). Dimensions: 48 mm x 38mm. This is compatible for Pixhawk Flight Controller. Optical flow processing at 4×4 grading image at 120 (indoor) to 250 Hz (outdoor). Superior light sensitivity with 24×24 μm super-pixels. Onboard 16bit gyroscope up to 2000°/s and 780 Hz update rate, default high precision-mode at 500°/s. PX4Flow Optical Flow Sensor comes with TFmini Plus LiDAR Distance Sensor and it is completely assembled. USB serial up to 921600 baud (including live camera view with QGroundControl). 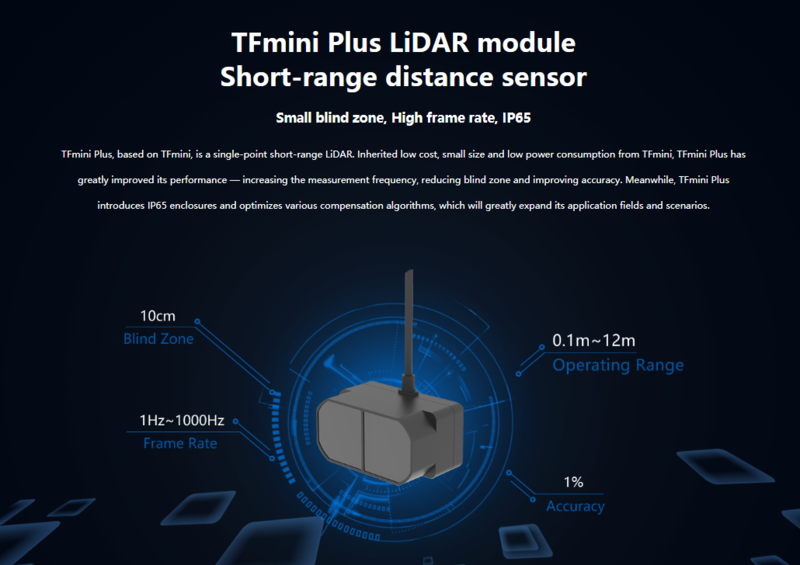 TFmini Plus LiDAR Distance Sensor range is 12m. PX4Flow optical flow sensor is known for its ability to make drone fly in non-GPS or GPS denied environment, however it needs a alittude sensor to work perfectly.